Where do you see yourself in ten years? 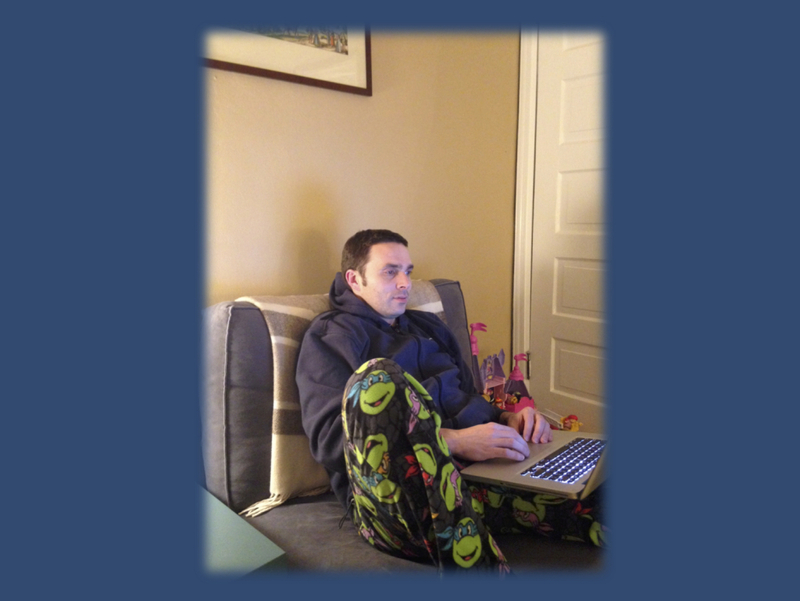 You probably might not imagine yourself wearing Ninja Turtle pajama pants, getting up at 4:00 in the morning for a teleconference. For some reason, I kept track of my very early beginnings in epilepsy genetics when I was still a medical student. According to my calendar, today is precisely my tenth anniversary in epilepsy genetics, a day that I refer to as Red Johanna Day. Let’s revisit what happened over the last decade and what I learned from my mentors and friends in the field. And let’s find out about the Ninja Turtles. Where do you see yourself in ten years? I am not quite sure whether I would have envisioned myself in Ninja Turtle pants in the early morning skyping with collaborators. By the way, this photo reveals some other intriguing details of my life – my daughter’s Disney castle in the background and a repro of an antique Kiel map above me, which our group gave us as a present earlier this year. Take home message: while the 10 year question might sound grandiose to start with, don’t be afraid to find yourself in a situation that is equally ridiculous as this. Red Johanna Beach. Exactly ten years ago, I was sitting in a rock pool at Red Johanna Beach in Victoria, Australia, reading Nigel Tan’s “The truth is out there”, a 2004 review on the state of association studies in epilepsy. The writing style and big picture view of his review made me realize that epilepsy genetics is something that I might actually be interested in – back then I had no idea what this was actually about and what I was about to get into. The international epilepsy genetics community is a dynamic and motivated group of clinicians, scientists, and patients. In the spirit of the season I’d like to dedicate this post to all my mentors and friends in the field and say Thank You for all the support and motivation over the last decade. Red Johanna Beach is located at the Great Ocean Road, a beautifully scenic drive at the southern coast of Australia West of Melbourne. Don’t worry. As you might have realized by now, this is one of my more biographic blog posts. If you are one of our readers who rather prefers the scientific part of our blog, please be assured that we will be back soon. However, the holiday season is also a time to reflect and think about issues in the larger context. Here are a few things I learned over the years about science, collaborations, and the ongoing quest of finding genes for human epilepsies. ”Look at the raw data.” We are swamped by data in genetics and we are already in a situation in which data interpretation rather than data generation is the main issue. What I learned early on was that you need to have a good sense of what the primary data looks like. Sometimes, in large data studies, we almost treat p-values as real numbers rather than looking at the primary data. My key realization that looking at primary data and visualizing data is important came when we worked on copy numbers. When looking at a table of all variants in the 15q13.3 region, you don’t get a good sense what is going on. However, when you plot the data, you suddenly realize that there are unique deletions in patients that are not found in controls. No p-value would ever tell you that. “There is no such thing as a quick paper.” Publish or perish. And how tempting is it to quickly put together this one striking case report that will put your name out there and boost both your medical and academic career. Except that it’s probably not true. Chances are that you will keep sitting on this one case report and it will become one of your more painful publications. What I experienced over the years was almost an inverse relationship: the easier the manuscript is at first sight, the longer the story actually gets. “Scientific achievement will only show over time.” I had various discussions with young scientists over the years who were virtually terrified by their career prospects. The ideal scientist is supposed to excel during his or her PhD with at least one Science or Nature publication and carry this momentum forward. Except that this is a completely faulted and almost toxic view of how science really works. The fact is that there is absolutely no guarantee that your PhD project will be a slam-dunk, independent of what your supervisor will tell you. And the truth is that it doesn’t need to be. You’re just adding part of the bigger picture and your contribution will become obvious over time. And then, at some point, there will be your study, your phenotype, your gene. But you cannot predict whether this will happen in one year, five years, or ten years. The only important thing is to stick with it and don’t give up. “Whenever you think about a spinal tap, do it.” This is a pediatric thing, a lesson that every pediatrician and child neurologist has learned at some point. As a clinician scientist, you always have to find a balance between patient care and research. And there are many different ways that people manage to accomplish this task. One important thing in pediatrics, however, is to never let your level of suspicion down. Trust your patients, but not their diseases, especially not in children. And be prepared for these moments when a single patient requires more time and effort and when you have to cancel teleconferences or be late for family dinner. I am thankful for the pediatrician who did a spinal tap on me when I was a toddler – I was found to have meningitis and was appropriately treated. This was important, as I was simply unwell and about to be sent home. But something on exam triggered a red flag. And this guy didn’t just think about a tap as a remote possibility. He simply did it and was probably late for dinner. “Whenever you can say ‘I’, try to say ‘we’.” The nature of science has changed over the last three decades, which is paralleled by constantly growing author lists. Particularly in the field of genetics, large-scale collaborative efforts are needed to achieve any meaningful results, an effort that requires team players. This is phenomenon that I sometimes refer to “the death of the alpha male scientist”. Official academic hierarchies are slowly undermined by unofficial scientific networks with a strong social component, and mutual trust is becoming the main scientific currency. Whenever you work with genetic data in a collaborative context, please keep in mind that many people have worked to make this happen. And this does not only involve your mentors and collaborators, but also the support and administrative staff. One way to say thank you to everybody and acknowledge the various contributions is by systematically replacing “I” with “we” when referring to scientific data, both in email and in presentation. Try it; it is a very efficient tweak to stimulate the social cohesiveness of your collaborative network. And remember, your collaborators very likely expect the careful management of a networker rather than the strong fist of an academic power player. Ninja Turtles. The pajama pants that I’m wearing in the photo are my Christmas gift from our senior residency class, a reference to a comment that I made about rather staying overnight at the hospital than taking call from home. I learned afterwards that there was choice between Superman and Turtle pants – I got Turtles. This entry was posted in 2014, Ideas, Motivation, Opinion and tagged data visualisation, Donatello, exome, Great Ocean Road, Leonardo, Michelangelo, motivation, Raphael, Red Johanna Beach, resilience, Teenage Mutant Ninja Turtles, Victoria, Young Scientists. Bookmark the permalink.